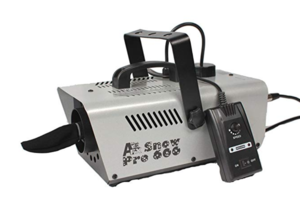 Rent a snow machine to create a flurry or blizzard effect. Variable Output allows you to control the intensity of the snow. 600 Watts with a 30-40 Foot Still Air Projection Range (Measured At 8ft mounting height and 45% Angle). Rental comes with 1 gallon of snow fluid, which will last about 20 minutes if on continuously.